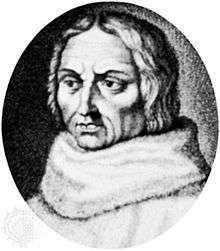 Jean Charlier de Gerson (13 December 1363 – 12 July 1429) was a French scholar, educator, reformer, and poet, Chancellor of the University of Paris, a guiding light of the conciliar movement and one of the most prominent theologians at the Council of Constance. Aged fourteen, he left Gerson-lès-Barby to study at the college of Navarre in Paris under Gilles Deschamps, (Aegidius Campensis) and Pierre d'Ailly (Petrus de Alliaco), who became his life-long friend. Gerson was born at Gerson-lès-Barby, Gerson (paroisse de Barby) a hamlet in the present municipality of Barby, Ardennes in the bishopric of Reims in Champagne. His parents, Arnulphe Charlier and Élisabeth de la Chardenière, "a second Monica," were pious peasants, and seven of their twelve children, four daughters and three sons, devoted themselves to a religious life. Young Gerson was sent to Paris to the famous college of Navarre when fourteen years of age. After a five years' course he obtained the degree of licentiate of arts, and then began his theological studies under two very celebrated teachers, Gilles Deschamps (Aegidius Campensis) and Pierre d'Ailly (Petrus de Alliaco), rector of the college of Navarre, chancellor of the university, and afterwards bishop of Puy, archbishop of Cambrai and cardinal. Pierre d'Ailly remained his lifelong friend, and in later life the pupil seems to have become the teacher (see preface to Liber de vita Spir. Animae). Gerson very soon attracted the notice of the university. He was elected procurator for the French 'nation' (the French-born Francophone students at the University) in 1383, and again in 1384, in which year he graduated bachelor of theology. Three years later a still higher honour was bestowed upon him; he was sent along with the chancellor and others to represent the university in a case of appeal taken to the pope. John of Montson (Monzón, de Montesono), an Aragonese Dominican who had recently graduated as doctor of theology at Paris, had in 1387 been condemned by the faculty of theology because he had taught that the Virgin Mary, like other ordinary descendants of Adam, was born in original sin; and the Dominicans, who were fierce opponents of the doctrine of the immaculate conception, were expelled from the university. John of Montson appealed to Pope Clement VII at Avignon, and Pierre d'Ailly, Gerson and the other university delegates, while they personally supported the doctrine of the immaculate conception, were content to rest their case upon the legal rights of the university to test in its own way its theological teachers. Gerson's biographers have compared his journey to Avignon with Luther's visit to Rome. It is certain that from this time onwards he was zealous in his endeavours to spiritualize the universities, to reform the morals of the clergy, and to put an end to the schism which then divided the church. In 1392 Gerson was awarded licentiate, receiving his doctorate of theology in 1394; and in 1395, when Pierre d'Ailly was made bishop of Puy, he was, at the early age of thirty-two, elected Chancellor of the University of Paris, and made a canon of Notre Dame. The university was then at the height of its fame, and its chancellor was necessarily a man prominent not only in France but in Europe, sworn to maintain the rights of his university against both king and pope, and entrusted with the conduct and studies of a vast crowd of students attracted from almost every country in Europe. Gerson's writings bear witness to his deep sense of the responsibilities, anxieties and troubles of his position. He was all his days a man of letters, and an analysis of his writings is his best biography. His work has three periods, in which he was engaged in reforming the university studies, maturing plans for overcoming the schism (a task which after 1404 absorbed all his energies), and in the evening of his life writing books of devotion. Gerson wished to banish scholastic subtleties from the studies of the university, and at the same time to put some evangelical warmth into them, giving them a more spiritual and practical focus. He was called at this period of his life Doctor Christianissimus; later his devotional and pastoral writings brought him the title Doctor Consolatorius. His plan was to make theology plain and simple by founding it on the philosophical principles of nominalism. His method was a clear exposition of the principles of theology where clearness was possible, with a due recognition of the place of mystery in the Christian system of doctrine. Like the great nominalist William of Ockham, he saved himself from rationalism by laying hold on mysticism—the Christian mysticism of Pseudo-Dionysius the Areopagite, the school of Richard of St. Victor, Bernard of Clairvaux, and Saint Bonaventure. He thought that in this way he would equally guard against the folly of the old scholasticism, and the seductions of such Averroistic pantheism as was preached by heretics like Amalric of Bena. His plans for the reformation of university studies may be learned from his Epistolae de reform. theol. (i. I 21), Epistolae ad studentes Coligii Navarrae, quid et qualiter studere debeat novus ideologiae auditor, et contra curiositatem studentium (i. 106), Lectiones duae contra vanam curiositatem in negotio fidei (i. 86), and De mystica theologia, speculativa et practica. The study of the Bible and of the fathers was to supersede the idle questions of the schools, and in his Tract. contra romantiam de rosa (iii. 297) he warns against the irreverent Roman de la rose of Guillaume de Lorris and Jean de Meun—a position in which he was joined by Christine de Pizan. He was often weary of the chancellorship—it involved him in strife and in money difficulties; he grew tired of public life, and longed for learned leisure. To obtain it he accepted the deanery of Bruges from the duke of Burgundy, but after a short sojourn he returned to Paris and to the chancellorship. Gerson's 1402 treatise De Vita Spirituali Animae was one of the first attempts at developing natural rights theory. He thought that freedom could be exchanged in the same way as property. Gerson's chief work was toward reconciling the great schism. Gregory XI had died in 1378 in Rome, one year after Gerson went to the college of Navarre, and since his death there were two claimants to the papacy, both elected by the cardinals, one in Rome and one in Avignon. This caused great confusion, as the Church could, at one time, only have one legitimate successor of St. Peter— and one faith, one Lord, one baptism, one "seamless garment of Christ". The schism had practically been brought about by France. The popes had been under French influence so long that it appeared to France a political necessity to have the pope reside in a French area, and pious Frenchmen felt themselves somewhat responsible for the sins and scandals of the schism. Hence the melancholy piety of Gerson, Pierre d'Ailly and their companions, and the energy with which they strove to bring the schism to an end. During the lifetime of Clement VII, the University of Paris, led by Pierre d'AiIly, Gerson and Nicholas of Clémanges, met in deliberation about the state of Christendom, and resolved that the schism could be ended in three ways,—by cession, if both popes renounced the office unconditionally, by arbitration, or by a general council. Clement died. The king of France, urged by the university, sent orders that no new pope should be elected. But, the cardinals held their election first, and only then opened the king's letter. In the new elections, however, both at Rome and Avignon, the influence of Paris was so much felt that each of the new popes swore to cede if his rival would do likewise. Meanwhile in 1395 the national assembly of France and the French clergy adopted the programme of the university—cession or a general council. The movement gathered strength. By 1398 most of the cardinals and most of the crowned heads in Europe supported the plan. During this period Gerson's literary activity was untiring, and the throb of public expectancy, of hope and fear, is revealed in his multitude of pamphlets. At first there were hopes of a settlement by way of cession. These come out in Protest. super statuni ecclesiae (ii. I), Tractatus de modo habendi se tempore schismatis, De schismate, etc. But soon the popes' intransigence strengthened the movement for a council—see De concilio generali unius obedientiae (ii. 24). A council was resolved upon, to meet at Pisa, and Gerson poured forth tract after tract for its guidance. The most important are Trilogus in materia schismatis (ii. 83), and De unitate Ecclesiae (ii. 113), in which, following Pierre d'Ailly (see Paul Tschackert, Peter von Ailli, p. 153), Gerson demonstrates that the ideal unity of the church, based upon Christ, destroyed by the popes, can only be restored by a general council, supreme and legitimate, though unsummoned by a pope. The council met, deposed both antipopes, and elected Alexander V. Gerson officially addressed the new pope on his duties in Sermo coram Alexandro Papa in die ascensionis in concilio Pisano (ii. 131). All hopes of reformation, however, were crushed by the conduct of the new pope, especially his immoderate partiality toward the Franciscan Order, of which he had been a monk. He issued a bull which laid the parish clergy and the universities at the mercy of the mendicants. The University of Paris rose in revolt, headed by its chancellor Gerson, who wrote the fierce pamphlet Censura professorum in theologia circa bullam Alexandri V (ii. 442). The pope died soon after, and John XXIII (Baldassare Cossa), was elected his successor. Instead of peace, the council of Pisa had produced only a third papacy. Pierre d'Ailly despaired of general councils (see his De difficultate reformationis in concilio universali), but Gerson struggled on. Gerson also fought against the murderous discords and cynicism of royal politics. The feuds between the houses of Orleans and Burgundy were ruining France. The king's brother, the duke of Orleans, had been murdered by the followers of the duke of Burgundy; and this had been publicly justified by a theologian, Jean Petit (c. 1360-1411). Gerson had Petit's "eight verities"—apologias for the murder—condemned by the University of Paris, the archbishop, and the grand inquisitor, and the book was publicly burned before Notre Dame. Gerson wished a council to confirm this sentence. His literary labours were as untiring as ever: he wrote that a general council could depose a pope; he drew up indictments against the reigning pontiffs, reiterated the charges against Jean Petit, and exposed the sin of schism—in short, he did all he could to direct the public mind toward healing the evils in the church. His efforts were powerfully seconded by the emperor Sigismund, and the result was the Council of Constance. Gerson's influence at the council was supreme up to the election of a new pope. It was he who dictated the form of submission and cession made by John XXIII, and directed the condemnation of Jan Hus. Many of Gerson's biographers have found it difficult to reconcile his proceedings against Hus with his own opinions upon the supremacy of the pope; but the difficulty has arisen partly from misunderstanding Gerson's position, partly from supposing him to be the author of a famous tract De modis uniendi et reformandi Ecclesiam in concilio universali. This, and the treatises De modis uniendi et reformandi Ecclesiam, and De difficultate reformationis in concilio universali, long ascribed to Gerson, were proved by Johann Baptist Schwab in his Johannes Gerson not to be his work, and have since been ascribed to Abbot Andreas of Randuf, and with more reason to Dietrich of Nieheim. All Gerson's high-sounding phrases about the supremacy of a council were meant to apply only in times of emergency. He was essentially a trimmer, not a reformer, and he hated Hus with all the rancor of a conservative at heart. The council of Constance, which raised Gerson's prestige to its height, in the end became his downfall. The council, overawed by the duke of Burgundy, would not affirm the censure of Jean Petit. The justification of murder was declared a mere opinion, not a doctrine, and only one of Petit's "verities" was condemned; and even this censure was annulled by the new pope, Martin V. Gerson dared not return to France for fear of Burgundy, who had taken power. He lived in unofficial exile in Constance, then at Rattenberg in Tirol, where he wrote his famous book De consolatione theologiae. On returning to France he went to Lyon, where his brother was prior of the Celestine monastery. Although Gerson was retired from active university life, the decade at Lyon was a time of great literary productivity. He produced a harmony of the gospels (the Monotesseron), works on the poems of the bible climaxing in a massive collection of twelve treatises on the Magnificat (Lk. 1:46-55), a commentary on the Song of Songs, as well as an extensive literary correspondence with members of the Carthusian order and others on mysticism and other issues of spiritual life. Shortly before his death he produced a tract in support of Joan of Arc. It is said that he taught a school of boys and girls in Lyon, and his only fee was to make the children promise to repeat the prayer, "Lord, have mercy on thy poor servant Gerson" (though this story has been questioned by Gerson's most recent biographer). He died at Lyon on the 12 July 1429. Tradition declares that during his sojourn he translated or adapted from the Latin a work upon eternal consolation, which afterwards became very famous under the title of The Imitation of Christ, attributed to Thomas à Kempis. It has, however, been proven that this work really was written by a Kempis and not by John Gerson or the abbot Gerson. Hobbins, Daniel. Authorship and Publicity Before Print: Jean Gerson and the Transformation of Late Medieval Learning. (Philadelphia: U of Pennsylvania Press, 2009). Brian Patrick McGuire, ed., A Companion to Jean Gerson, Brill's Companions to the Christian Tradition: 3. (Leiden: Brill Academic Publishers, 2006) (hardcover, ISBN 90-04-15009-9). Brian Patrick McGuire, Jean Gerson and the Last Medieval Reformation (University Park, PA, 2005). Mark Burrows, Jean Gerson and De Consolatione Theologiae (1418 : the Consolation of a Biblical and Reforming Theology for a Disordered Age). (Coronet, 1990). James Connolly, John Gerson: Reformer and Mystic (Louvain, 1928). Henri Jadart, Jean Gerson, son origine, son village natal et sa familie (Reims, 1882). J. B. Schwab, Johannes Gerson, 2 vols. (Wurzburg, 1859). Charles Schmidt, Essai sur Jean Gerson, chancelier de l'Université de Paris (Strassburg, 1839). 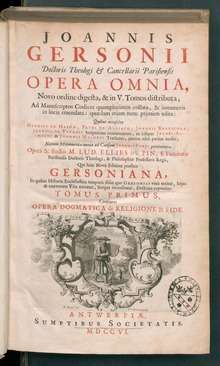 Ellies Dupin, Gersoniana, including Vita Gersoni, prefixed to the edition of Gerson's works in 5 vols. (Antwerp, 1706), cited above. See also Ulysse Chevalier, Repertoire des sources hist., Bio-bibliographie (Paris, 1905, etc. ), s.v. Gerson." On the relationship between Gerson and D'Ailly see Paul Tschackert, Peter von Ailli (Gotha, 1877). On Gerson's public life, see also accounts of the councils of Pisa and constance, especially Hermann von der Hardt, Con. Constantiensis libn IC. (1695–1699). A modern edition of Gerson's works in French and English is: Jean Gerson, Oeuvres Complètes, ed. Palémon Glorieux, 10 vols. (Paris, 1960–1973). The best older editions are those of Edmond Richer (3 vols., Paris, 1606) and Ellies Dupin (5 vols., Antwerp, 1706). The Consolation of Theology = De consolatione theologiae, ed and tr. CL Miller, (New York: Abaris Books, 1998). For English translations of selected early works, see Brian Patrick McGuire (tr. ), Jean Gerson: Early Works, Classics of Western Spirituality, (New York, 1988). Jean Gerson: Selections from A Deo exivit, Contra curiositatem studentium and De mystica theologia speculativa, introduced, edited, translated and annotated by Steven E. Ozment, (Leiden: E. J. Brill, 1969). Wikimedia Commons has media related to Jean Gerson. ↑ Richard Tuck, Philosophy and Government 1572-1651 (1993), pp. 25-7. ↑ David Graeber, Debt: The First 5,000 Years (2011), p. 206.